The Aneroid Calibrated® V-Lok® Inflation System consists of a Latex or Non-Latex bulb, Air-Flo® control valve, Latex or Non-Latex bag and Calibrated® V-Lok® Cuff. 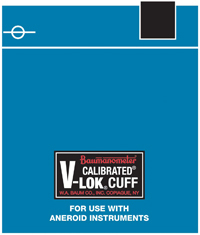 Accurate: The Calibrated®V-Lok® system clearly indicates whether or not the correct size cuff is being used. The center of the bladder is clearly marked on the inner and outer surfaces of the cuff for correct application on either the right or left limb. Hook and loop fasteners are used to provide the optimal number of open-close cycles. Comfortable: Cuffs conform to the shape of the limb and have no hard, stiff edges. Durable: Baum cuffs are made of tightly woven, heat set Dacron™ polyester fabric. They are double stitched at critical points for long wear and treated with an effective anti-microbial agent. Non-Latex: Available for those who are hypersensitive to natural rubber latex. Guaranteed: Latex and Non-Latex inflation bags, bulbs and tubing are guaranteed for five years.